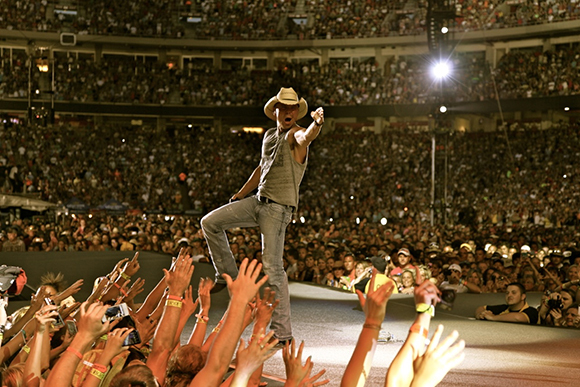 After breaking NINE attendance records, and selling in excess of 1.3 million tickets on The Big Revival Tour, veteran performer and country legend Kenny Chesney heads out on his Spread The Love Tour in 2016, and it's going to be HUGE!!! Touring with country-rock five-piece Old Dominion, Chesney comes to Blossom Music Center on Thursday 26th May for an incredible night that you will never forget! Kenny Chesney is an American and songwriter. He released his first album, In My Wildest Dreams, in April 1994. To date, Chesney has recorded twenty albums (he has sold over 30 million albums worldwide), fourteen of which have been certified gold or higher by the (RIAA), and has produced more than forty top 10 singles on the U.S. Billboard Hot Country Songs and Country Airplay charts, 28 of which have reached number 1 on the charts. Most of these have also charted high within the top 40 of the Billboard Hot 100 mainstream chart, making him one of the few successful crossover country artists. He has received six Academy of Country Music awards (including four consecutive Entertainer of the Year awards from 2005 to 2008), as well as six awards from the Country Music Association. The Country Music Association honored Chesney with the Entertainer of the Year award in 2004, 2006, 2007, and 2008. Other notable awards that he received include the Academy of Country Music's 1997 New Male Vocalist of the Year, 2002 Top Male Vocalist of the Year, and the Triple Crown Award in 2005. He was awarded his fourth consecutive Entertainer of the Year award from the Academy of Country Music on May 18, 2008.